Spoiler Alert! If you haven’t started Knights of the Fallen Empire yet, this is not the blog post you’re looking for! I saw in my website statistics that a number of people were asking this question as part of their web searches (blame my day job, I’m used to doing this kind of research) so I thought why not actually answer it? So here goes. Popping the Question: Will You Kneel or Will You Defy? After possessing almost the entire planet of Ziost, and then subsequently destroying all life on the planet, the Sith Emperor seems to retreat off into the Galaxy somewhere. In the initial chapters of Fallen Empire, he reveals that he didn’t disappear but that building Zakuul was his focus, not his distraction. Seemingly less hell-bent on destruction, the Emperor you meet in the form of Valkorion reiterates that “you alone” have got his attention. This does hark back to almost the last scene on Ziost where the Emperor’s voice tells you that he wants to keep you alive (at least for the time being) so that you can see the end of it all. What a priviledge – not. As ever, his pride and ego-centrism spews forth – telling you time and again of the depths of his power. However, it seems the Emperor still admires your own power, your resolve and your ability to have an impact wherever you go. So, with Arcann his son looking on, he says that he will share his power with you “if you will only kneel”. My Jedi Sentinel, Zav-Yun Ghiran, a dissillusioned and battle-worn Battle Master. Tired of fighting against a seemingly impossible enemy. Fighting the good fight no longer felt worth it to this character. So when this question was posed, he chose to kneel. So what happens if you kneel, rather than attack Valkorion? Impact 1: Valkorion starts transfering some power to you in the cut-scene. Impact 2: Arcann gets very jealous. He intimates that after years of serving the Immortal Emperor, neither he nor his siblings got this opportunity. So while Valkorion is focussed on you, Arcann seizes the opportunity and strikes down his father. The end of the scene is the same regardless of choice, with Arcann blaming the Outlander for Assassinating the Emperor. Update: I finally managed to get round to recording the cutscene of kneeling to Valkorion. 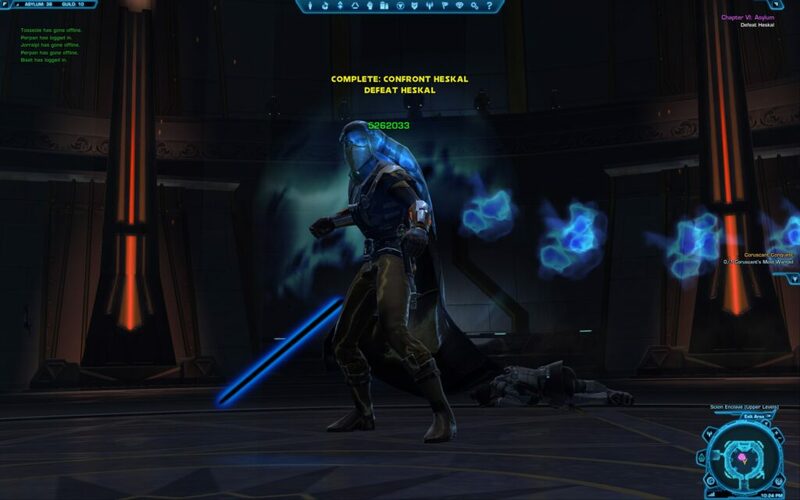 The new Galactic Command / CXP System enabled me to replay the chapter, whereas before that I would have to have started KotFE on a new character to do it. This is how I chose to still stand against Arcann – the unjust accusation of another power-hungry ruler – Arcann. There are only a few instances of changes from kneeling – mostly in conversations referring to the ‘deal’ you struck with Valkorion. In the three opportunities of ‘paused time’ you get the same option to accept or refuse the Emperor’s power. However, I noticed that if you accepted twice and tried to refuse Valkorion’s power the third time, you do not have the option to refuse. I found a helpful YouTube video which illustrates this. Despite the seeming character transformation, the Immortal Emperor still shows he is a control freak – although being honest, Arcann is no better on that score. 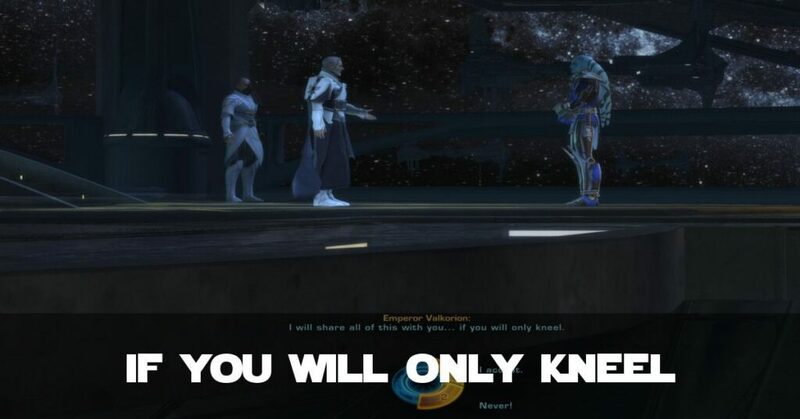 So, should you kneel to Valkorion or Defy Him? There is no right answer! The whole purpose of Fallen Empire is for you to decide your own fate. With Chatper X – Anarchy in Paradise, BioWare have warned us that the consequences of our choices will begin to take shape. So whatever your choice is – to bow before the Immortal Emperor or to kill him while he gets distracted by Arcann – make sure you make peace with that decision – and fast! TL;DR – What Happens If You Kneel in KotFE? The end result is still the demise of the Emperor, which is a shame, but would involve a rewrite of the immediate chapters depending on choice, which would have been a lot of work for BioWare. However, the reason you’re against Arcann is different. And there are dialogue changes. And because I connect with my characters in SWTOR, my Jedi became darker and more selfish as a result. Now he had some of his ‘free will’ taken away, he may begin to react against Valkorion now, but we will see what happens once Chapter X drops. This was a really fascinating read! So far, I’ve only had one character reach the KotFE content, and that only recently, so I’m feeling a bit spoiled by not having to wait for story bits to come out. But my smuggler would rather die a horrible, horrible death than give in to Valkorian, so kneeling wasn’t ever on the table for her (and she tells him some variant of ‘go away’ every time he pops up with advice). It’ll be interesting to play through it again later with a character who might be a little more power-hungry (or less concerned with Valkorian being a world-killing mass-murdering monster).